Question: How do you explain what a chola is to someone who has absolutely no frame of reference as to what one might be? 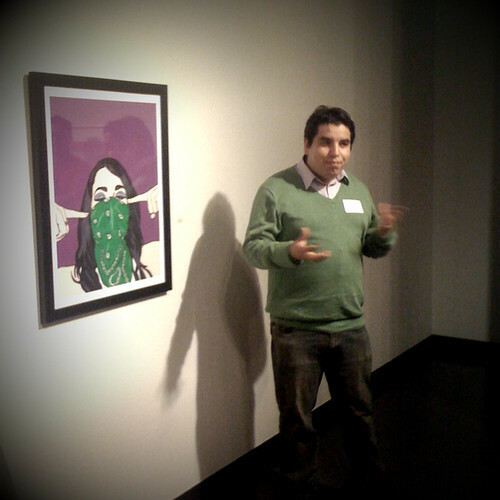 Tonight I was part of the 2009 Chicana/o Biennial artist talk at MACLA. It was great to see my peeps and peers talking about their work like my boy Jaime Guerrero, my homegirl Viva Paredes, and Seattle-bound sculptor Gustavo Martinez (additional shouts to Mariela, Rachel, and Lex for coming out to support us). I missed seeing MACLA’s wonderful Stephanie Chiara but otherwise it was the perfect night. The discussion of my work MACLA went really well but I was stymied by a little old lady who had no idea what a Chola was. While I was talking about my portrait of Ask a Chola she wanted me to explain to her what a chola was. Every explanation was dependent on refering to some part of urban Latino culture and she couldn’t grasp anything I tried to communicate to her. I wasn’t expecting to have to define a chola in talking about my work but it was my fault for not being able to think on my toes. What’s the best way to cleanly and concisely explain to someone what a chola is? Speaking of Cholas, Cholo rapper Deadlee has put me on blast on his blog. He didn’t care for the review that I gave to his recent movie, homophobic cholaxploitation film Hoochie Mamma Drama. You can read my review HERE and chime in on the comments section if you want. I have no interest in any sort of blog-beef and I wish Deadlee the best of luck in his career. After seeing Jim Mendiola’s amazing video for Girl in a Coma’s Static Mind I wanted to further explore photo sequence animation. This was a casual first try, Mariela and I had a lot of fun taking photos in sequence throughout the Mission District. More to come, hopefully. I have some big Ghetto Frida news coming soon and the image at the top is a small preview of more to come. Stay tuned.